The cost of mobile worker safety incidents is one that every utility wants to avoid. With the introduction of technology into the space, we’re starting to see progress in utilizing information and real-time data to reduce dangerous situations and keep accident rates down. Intel is now bringing IT and OT data together to address IoT opportunities across many industries, including energy, and transform the way businesses work. Imagine a workplace where incident awareness and response were nearly immediate. The newest Intel® IoT Gateway platform architecture was originally developed to enable a broad ecosystem of partners to quickly deliver innovations to customers, reduce complexity, and define how devices can securely connect to the cloud. The first of many solutions based on this new platform is ready to go. 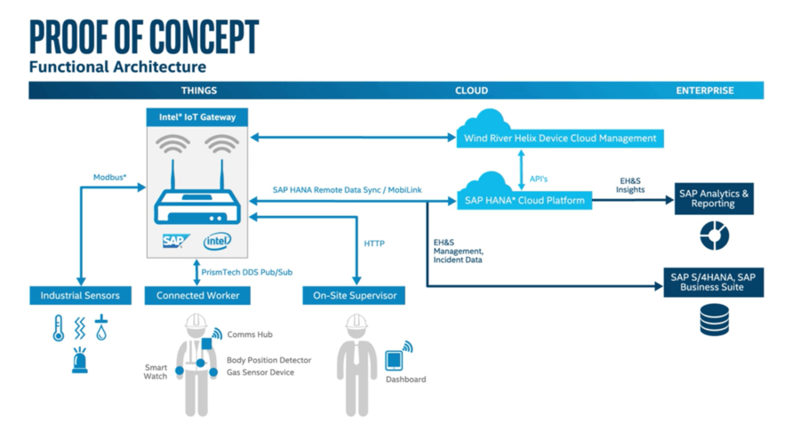 In partnership with SAP, this proof of concept delivers hardware and software products that will pay dividends for the utility industry of tomorrow as well as connected workers. By providing real-time analytics and a remote dashboard to monitor sensor data and report incidents, this solution can change the game in field worker safety, productivity and efficiency. The solution includes Quark™ processors as the intelligent sensor to monitor things like heart rate and hazardous gases, connected devices to monitor things like body posture, and a comprehensive cloud suite with real-time analytics and tracking capabilities from SAP. Because we know the safety of mobile field workers is the most important factor in the utility space, this solution can help you analyze and reduce health related incidents on an ongoing basis. To learn more about this solution, watch the video. Stay up to date with Intel Energy by following us on Twitter. Previous article:Can Zealous Security Cause Harm?